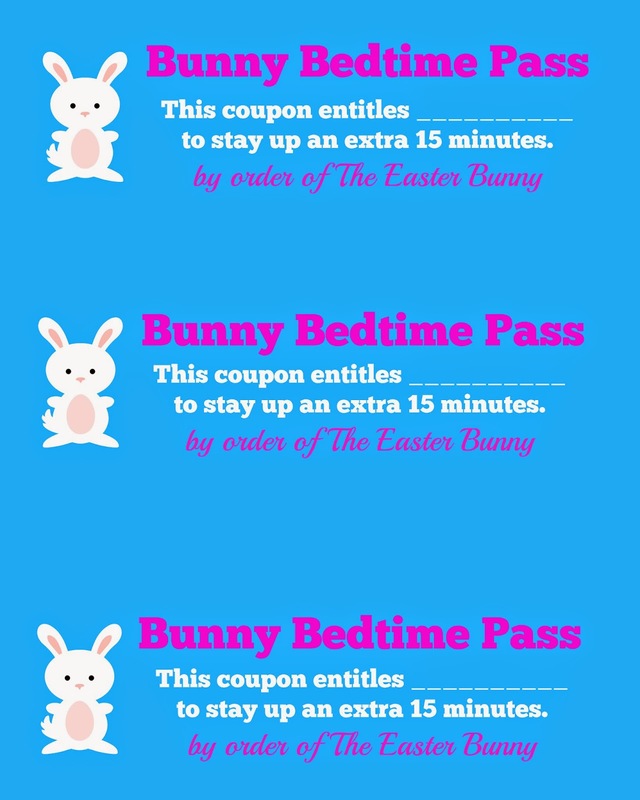 I love "non-candy" ideas for filling Easter baskets and Easter Eggs, so I designed these FREE printable "Bunny Bedtime Coupons". I am so excited for the kids to find them on their Easter egg hunt! To print these coupons, right-click on the picture below, save it to your computer, and print it like a regular 8X10 photo. I sent mine to my local copy store and had them printed for 39 cents. What's your favorite way to fill plastic Easter eggs? 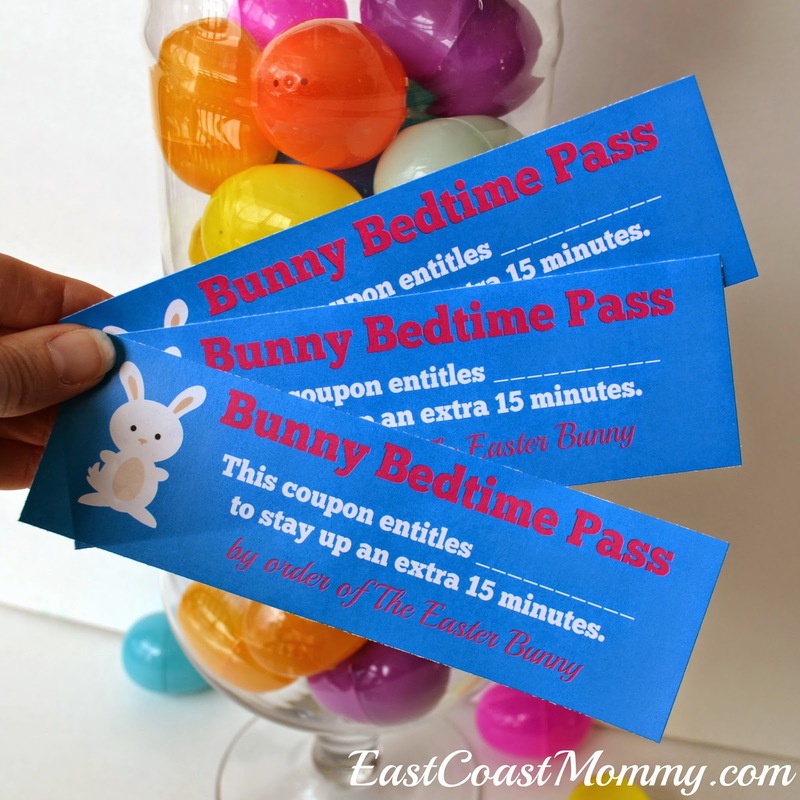 Do you think your little ones might find some "bunny bedtime passes" this year? Over the years, I have designed a number of adorable Easter printables, and today I am sharing a collection of some of my favorites. 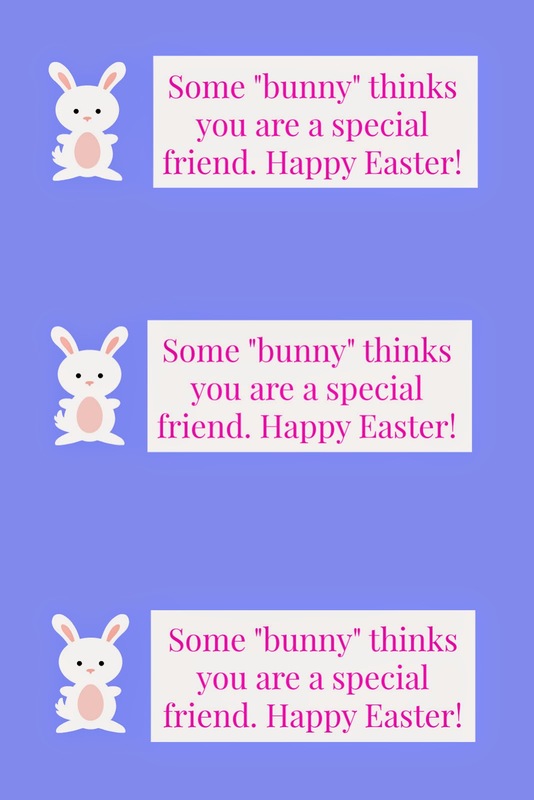 I hope you enjoy these 10 adorable (and free) Easter tags and templates. 1) Tag for Teacher Gift - Teachers are a special part of our children's lives, and they deserve a special treat this time of year. 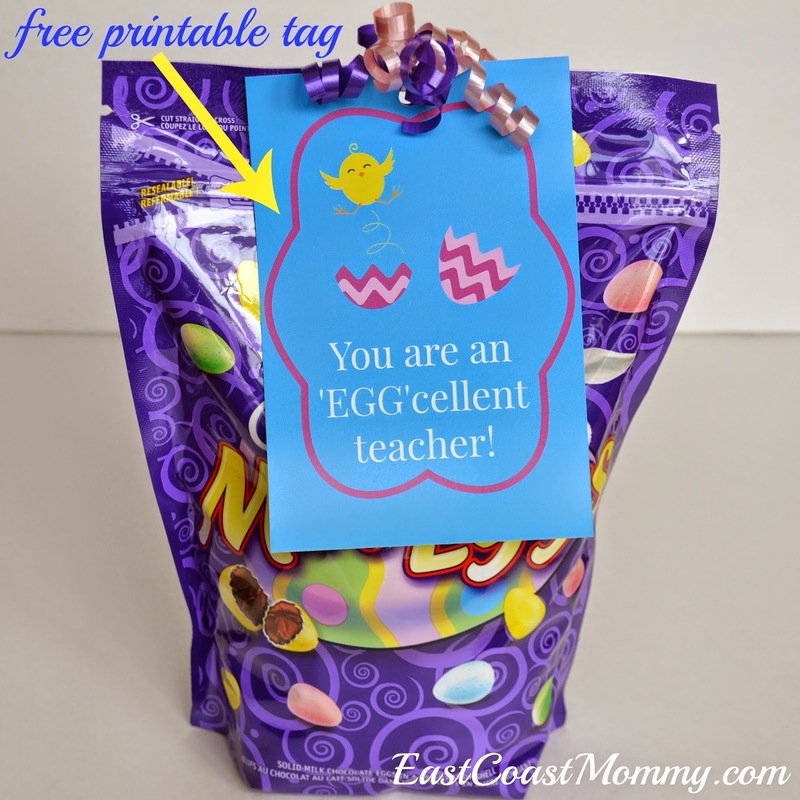 Add an adorable tag to a bag of candy coated chocolate eggs for an easy and inexpensive Easter gift. To download the tags, click here. 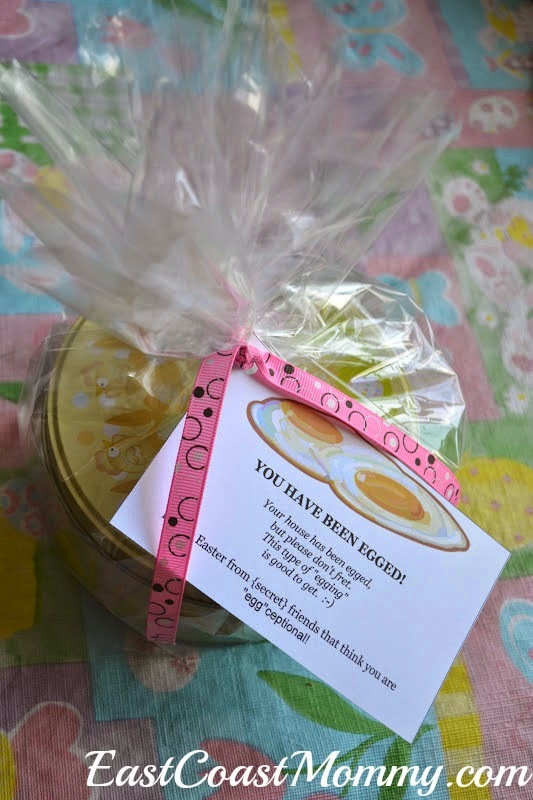 2) "Egging" the Neighbours Gift Tag (version 1) - Show your neighbours they are "egg"stra special (and have some fun) by secretly delivering treats to their homes this Easter. To download the tags, click here. Egging the Neighbours Gift Tag (version 2) - "Egging" the neighbours is an annual tradition in our house, so I have designed several different tags. Don't worry about deciding which one to use -- both versions are super-cute. 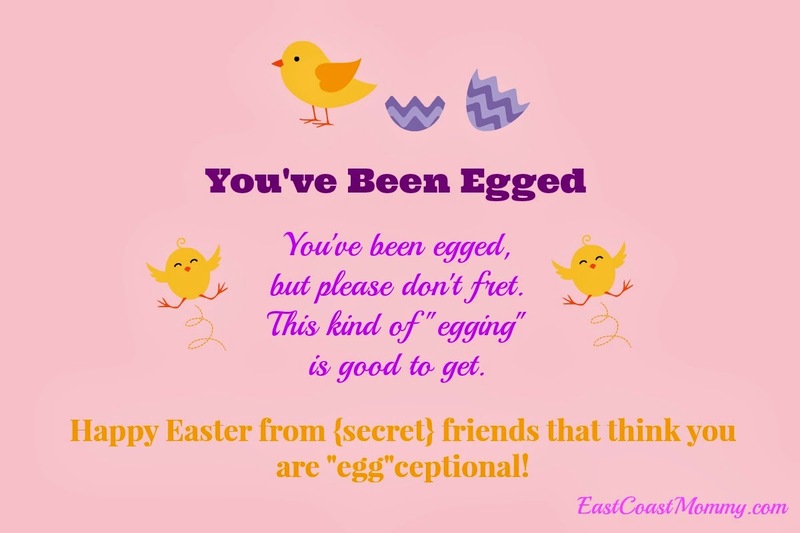 To download this version of the "egging" tag, click here. 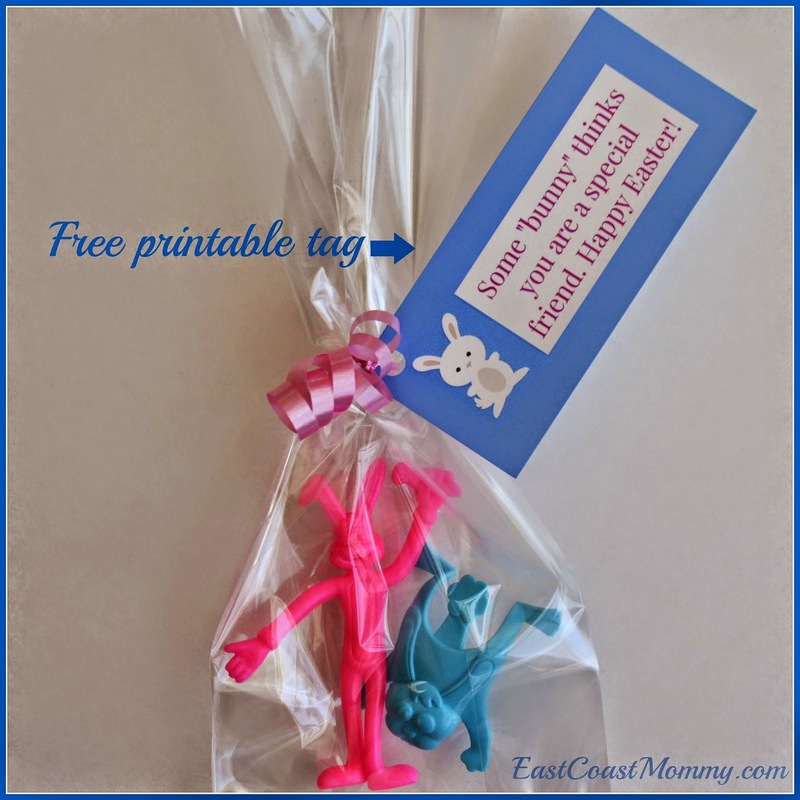 3) Bunny Bait Tags - A sweet and salty treat is even better when it is packaged in little bags with the adorable tags you can download here. 4) Tag for Class Treats - Chocolate isn't the only option for classroom treats. 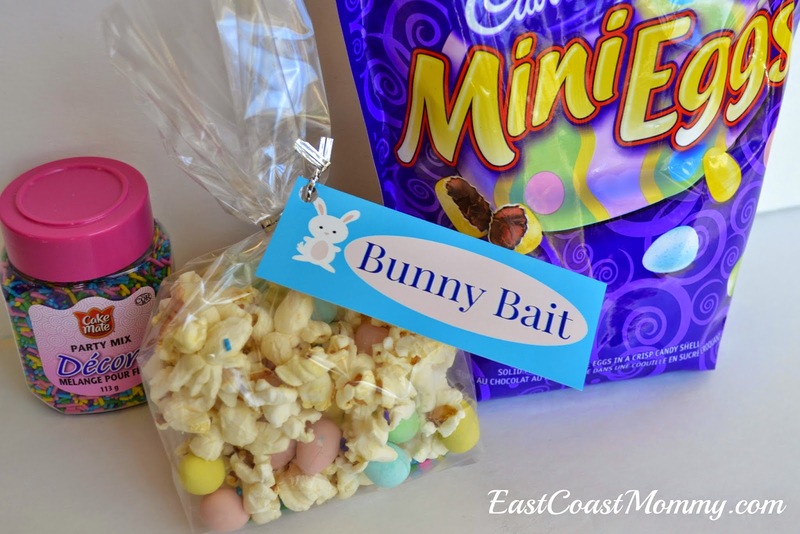 With these adorable tags and a few dollar store bunnies, the kids won't miss the sugar for one second. To download the tags, click here. 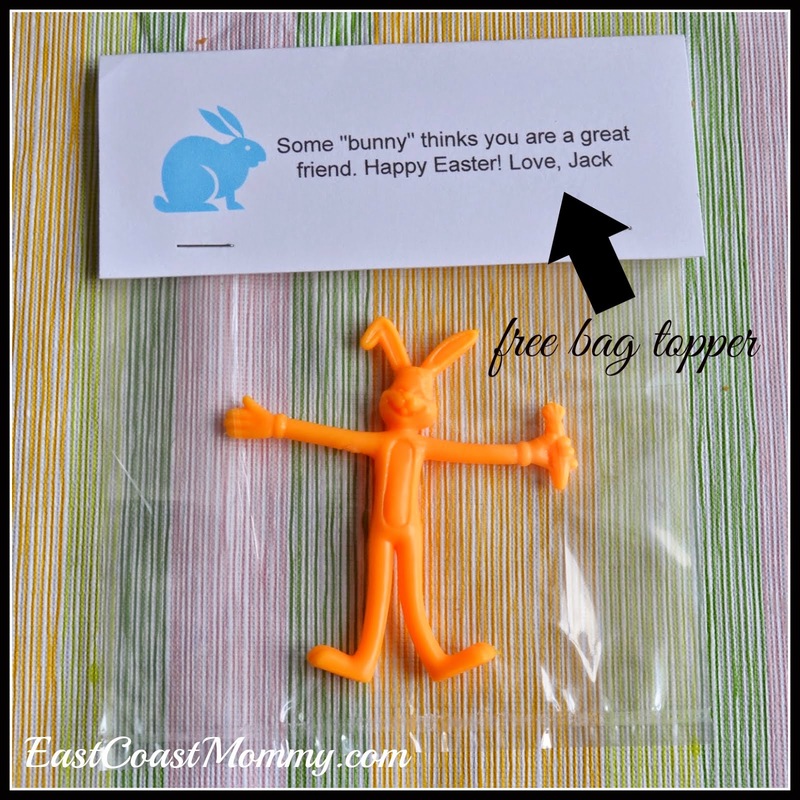 5) Bunny Bag Toppers - Giving a bunny (instead of a chocolatey treat) is a breeze with this adorable bag topper. Print it, cut it out, fold it, and staple it in place. Easy peasy! To download the bag toppers, click here. 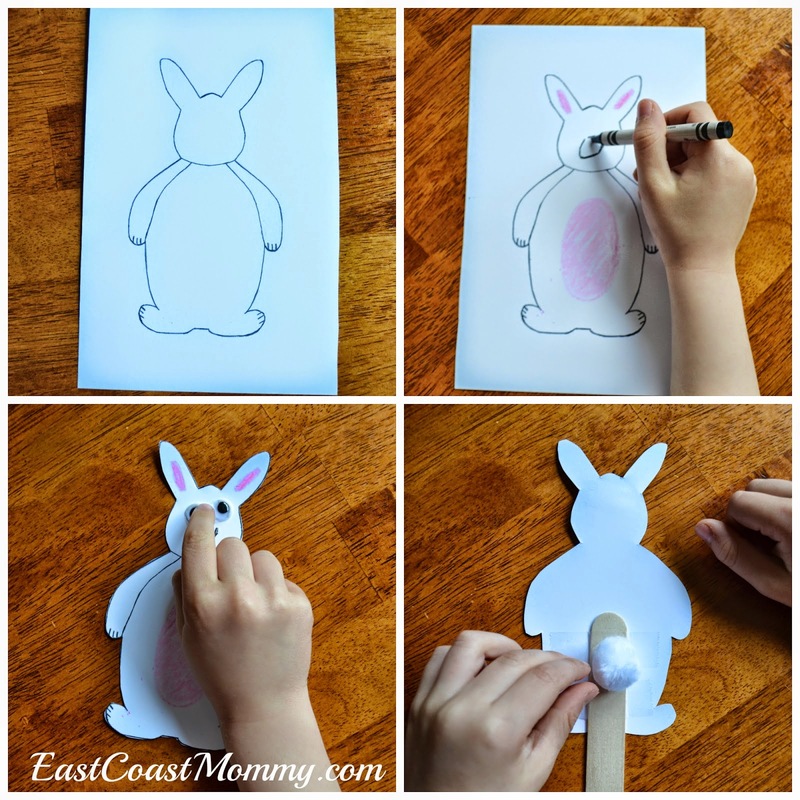 6) Bunny Puppet Printable Template - Crafting with kids is a great way to foster their creativity, and it's a wonderful screen-free way to spend time together. 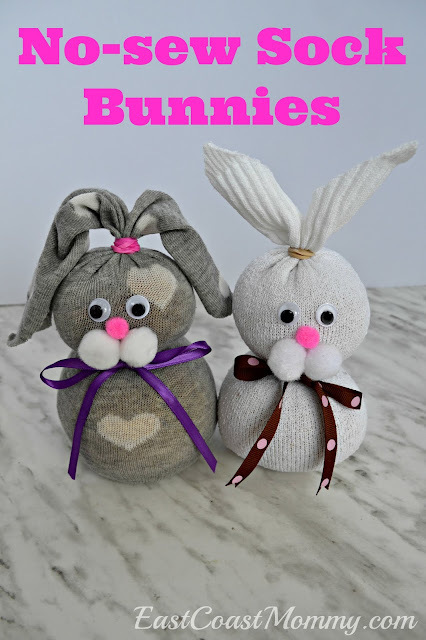 This adorable bunny puppet is easy to make, and the pom pom tail is too cute for words! To download the bunny puppet template, click here. 7) Bunny Silhouette Coloring Sheet - Coloring is a fun activity for children of all ages, and this printable bunny silhouette provides a fantastic opportunity for kids to design their own adorable holiday decor. After the kids color the bunnies, cut them out, and string them on a piece of twine to create a sweet bunny bunting that everyone will love. To download the coloring sheet, click here. 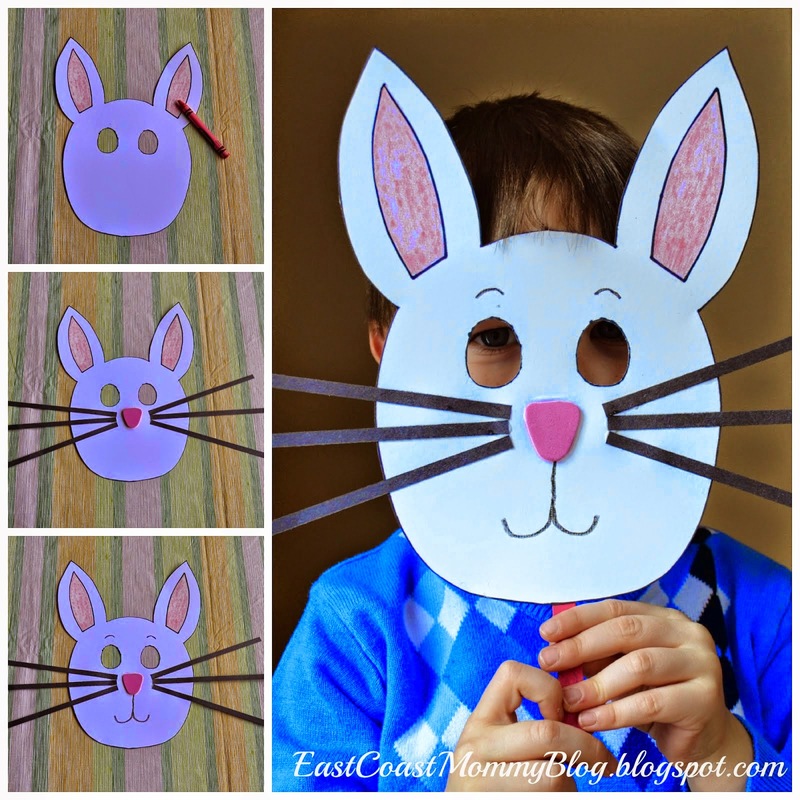 8) Bunny Mask Template - This bunny mask is a fun craft project that will transform your little one into the cutest bunny in town. Who wouldn't love this easy to make bunny disguise? To download the bunny mask template, click here. 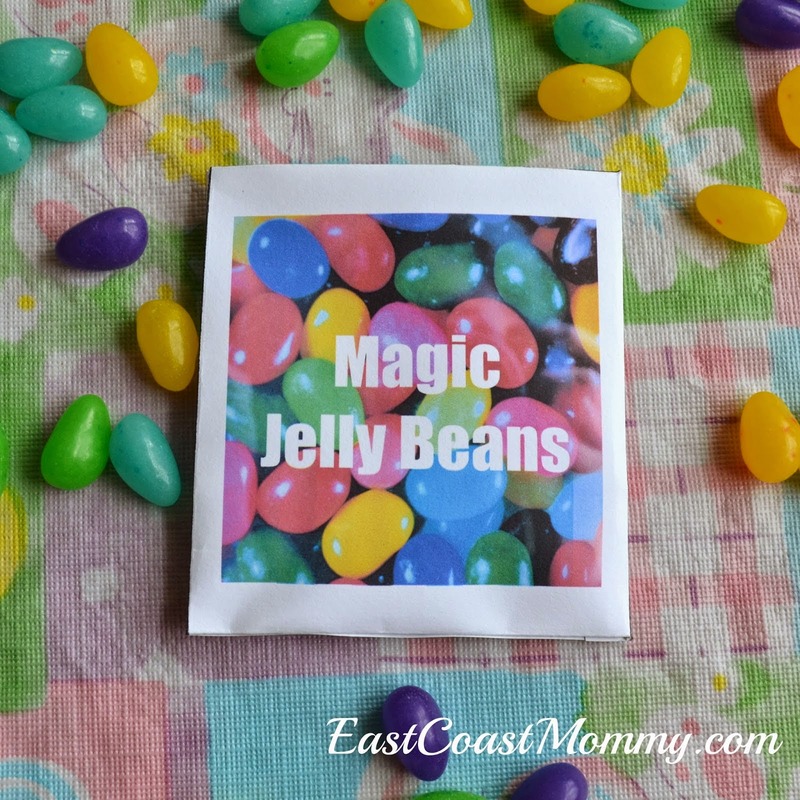 9) Printable Magic Jelly Beans Envelope - The Easter Bunny has been bringing my boys Magic Jelly Beans for years, and they always grow into something wonderful. Would your little one enjoy finding this treasure in his/her Easter basket? To download the envelope template, click here. 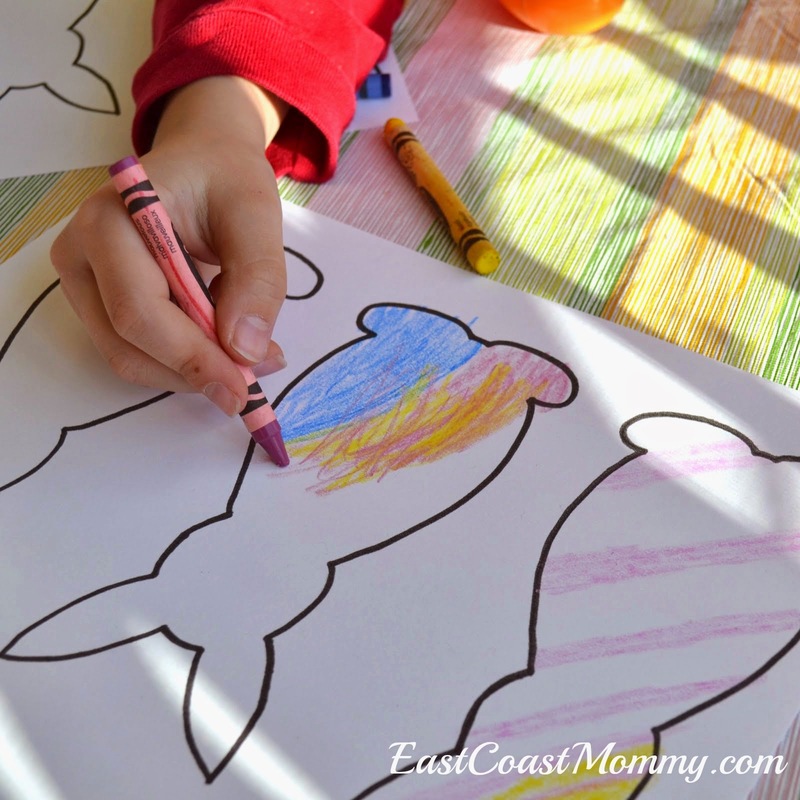 10) Paper Easter Basket Template - Sometimes simple crafts are the best ones. 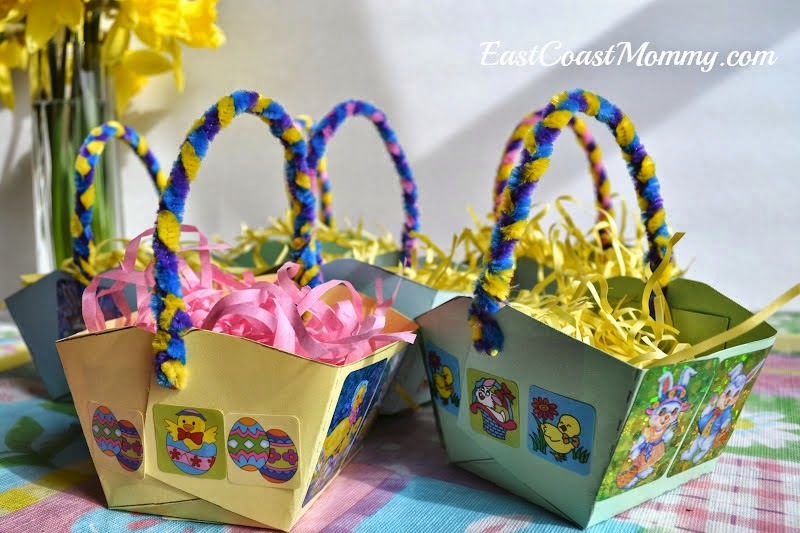 Kids can use their imaginations to decorate these baskets any way they want to. When they are finished, add a handle, and fill the basket with goodies. Wouldn't these make cute place cards or special treats to share with friends/neighbours? To download the Easter basket template, click here. 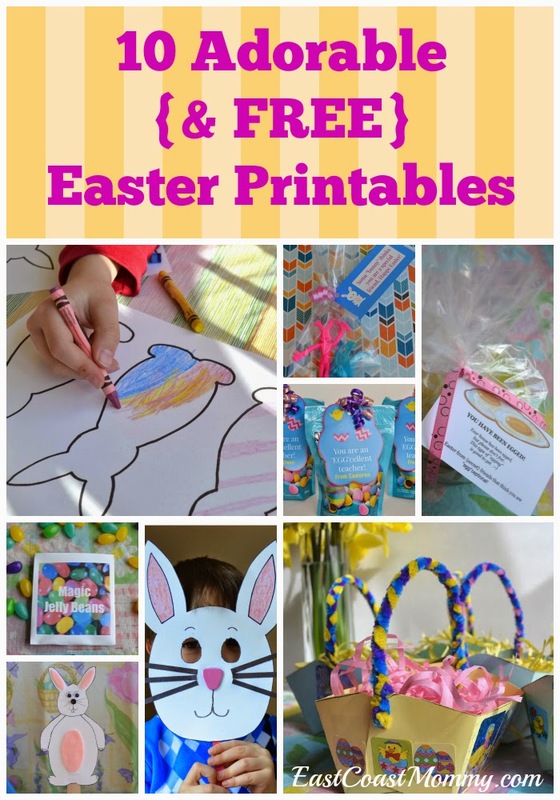 I hope you enjoy this collection of FREE Easter printables. I'd love for you to let me know which one is your favorite. 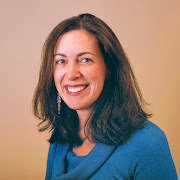 I think teachers are awesome, and I think it is important for me to teach my boys to show their appreciation to these important role models whenever possible. So, on holidays, we like to make special treats for them. 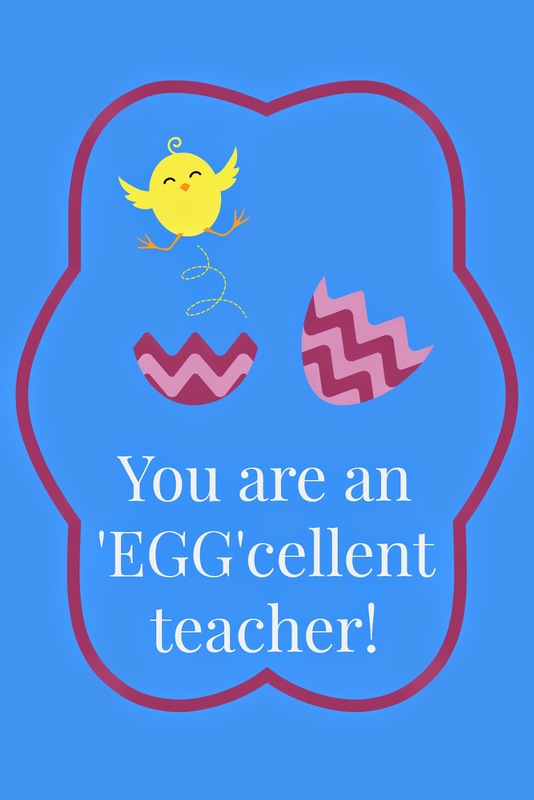 This year, I designed special tags to let my boys' teachers know that we think they are 'EGG'cellent! 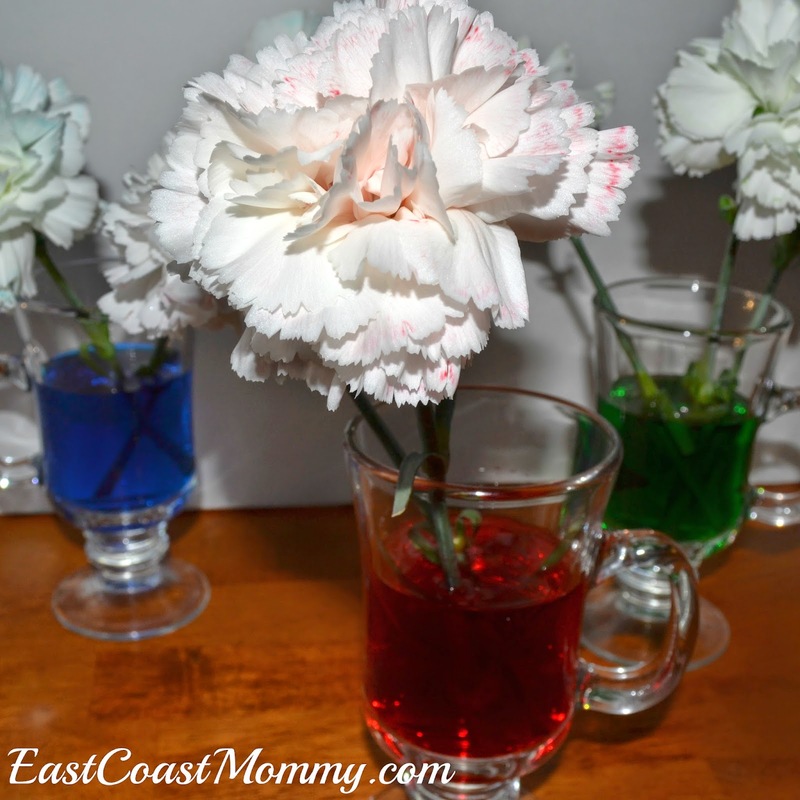 Aren't easy and inexpensive DIY gifts the best? 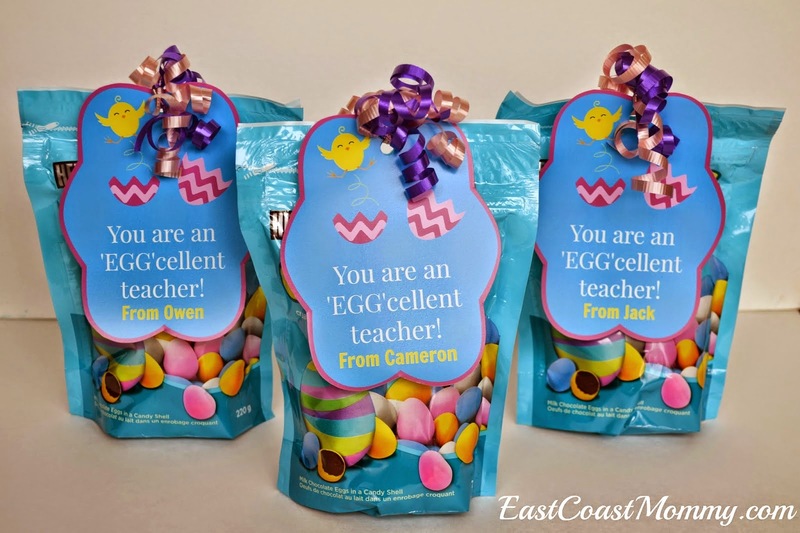 To make these Easter teacher gifts, I bought big bags of candy-coated chocolate mini eggs and attached adorable little tags. To download the tag I designed (for free), right-click on the picture below, save it to your computer, and print it like a regular 4X6 photo. ... or you can cut it out. You can't lose because both options are adorable! My boys are super-excited to share these sweet treats with their teachers. 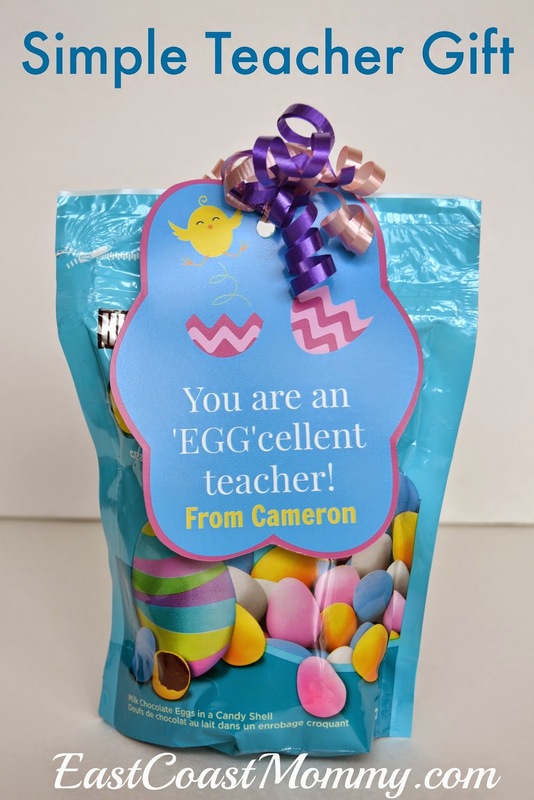 Do you like to give an Easter gift to your little one's teacher? 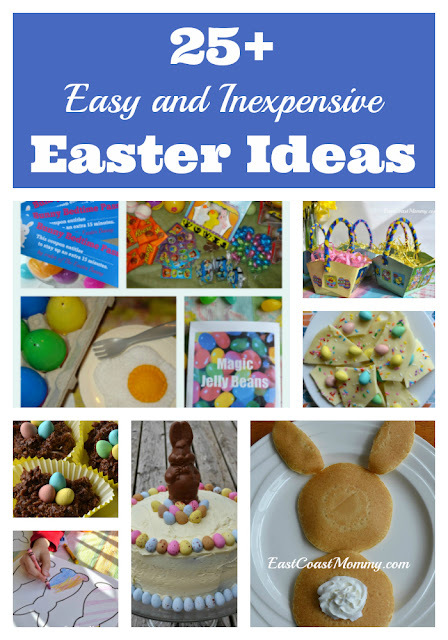 Find more ideas for easy and inexpensive Easter crafts, recipes, and activities here. Winter is winding down, but there is still time to squeeze in a little more winter fun. 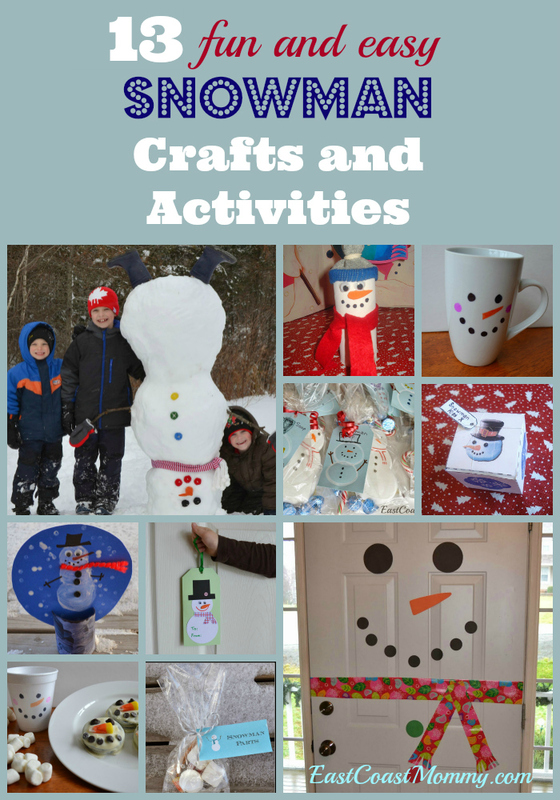 Today I am sharing a fantastic collection of fun and easy snowman crafts and activities that I have done with my boys. They are guaranteed to brighten up a dreary winter day. 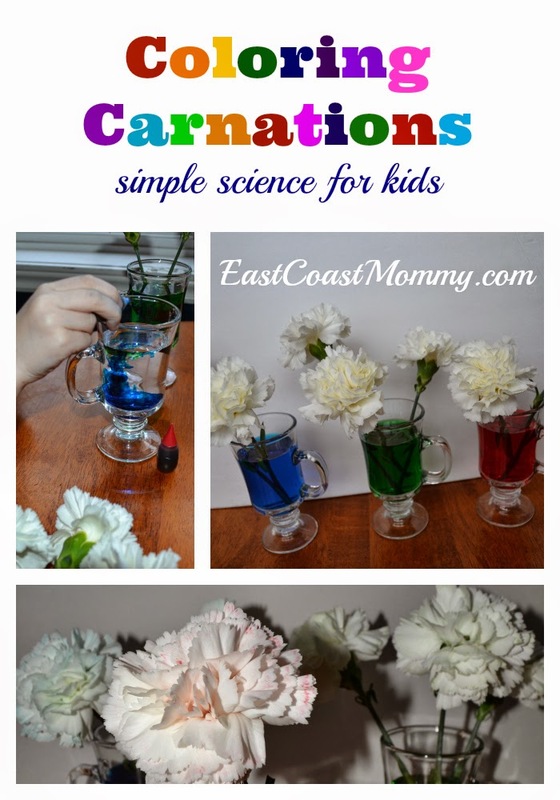 Check out the links below for more details, great tutorials, and free printables. 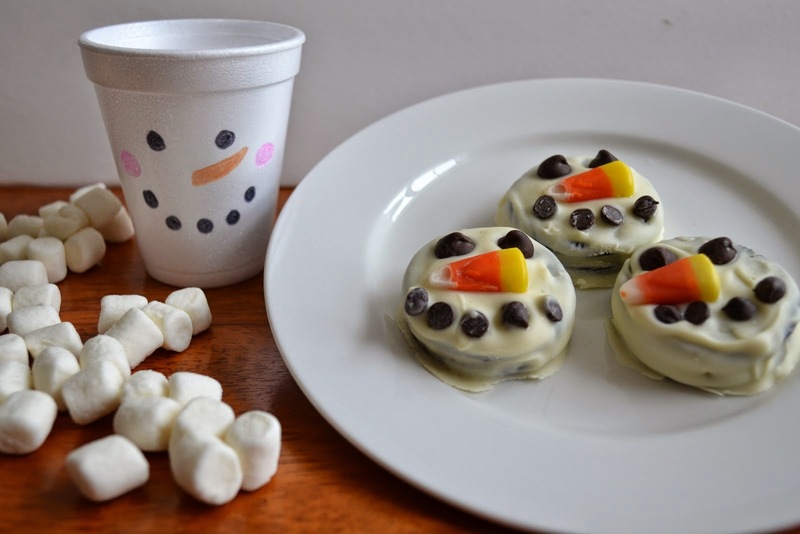 1) Snowman snack - Kids will love transforming Oreos into these adorable (and tasty) snowman snacks. They are a perfect snack after an afternoon of sledding. Get the full "how to" here. 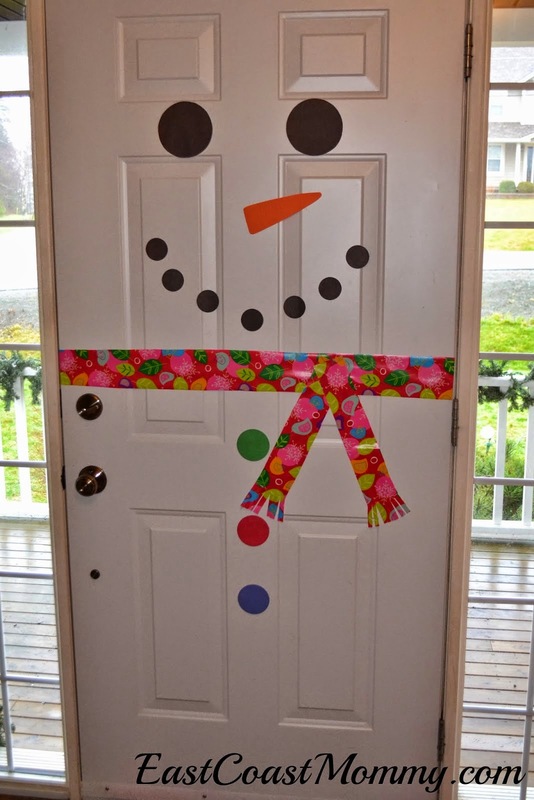 2) Snowman door - The kids will have a fantastic time transforming a plain white door into an adorable "indoor" snowman. Find the secret behind this cute creation here. 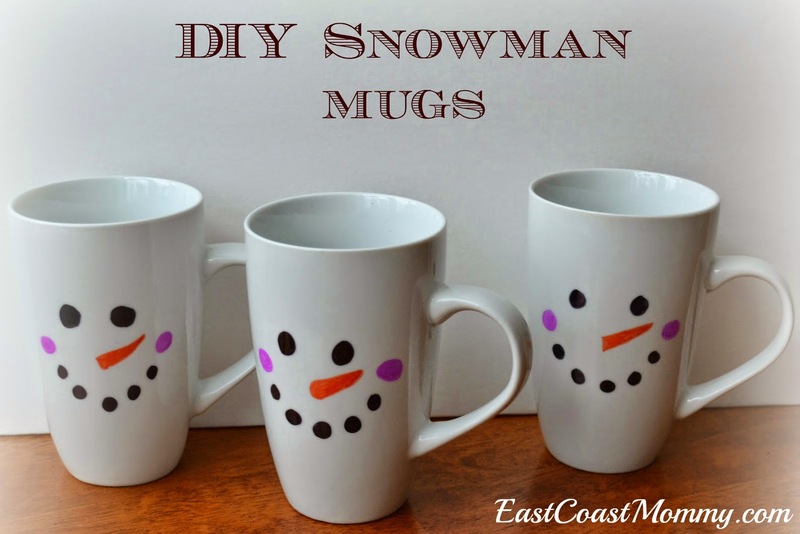 3) Snowman Mug - Grab some markers and white dollar store mugs, and you'll have everything you need to make these adorable snowman mugs. Find the full tutorial here. 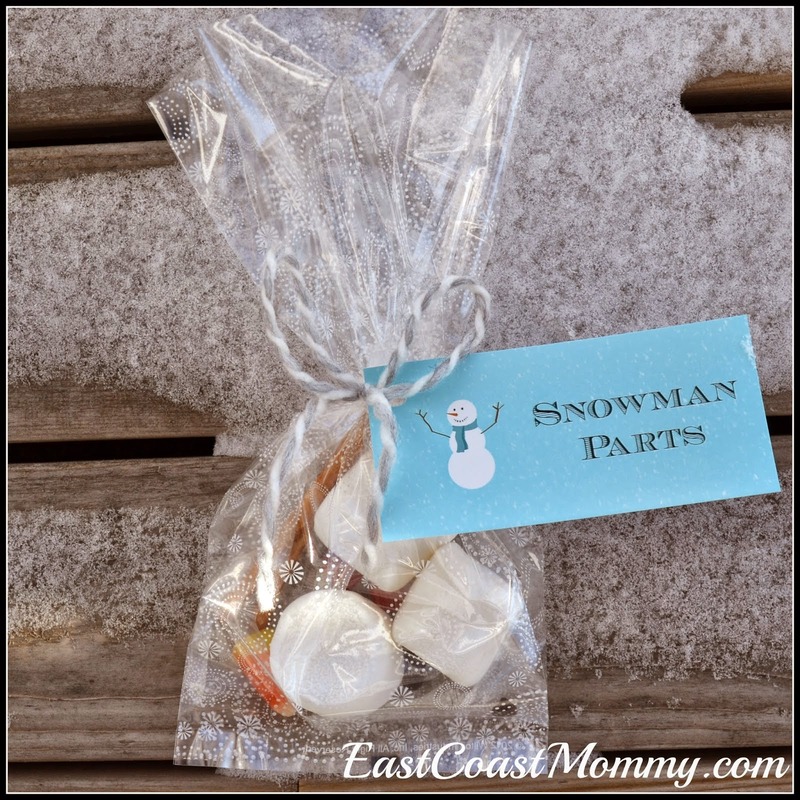 4) Snowman Party Favor - These treat bags make sweet winter snacks and adorable winter party favors. 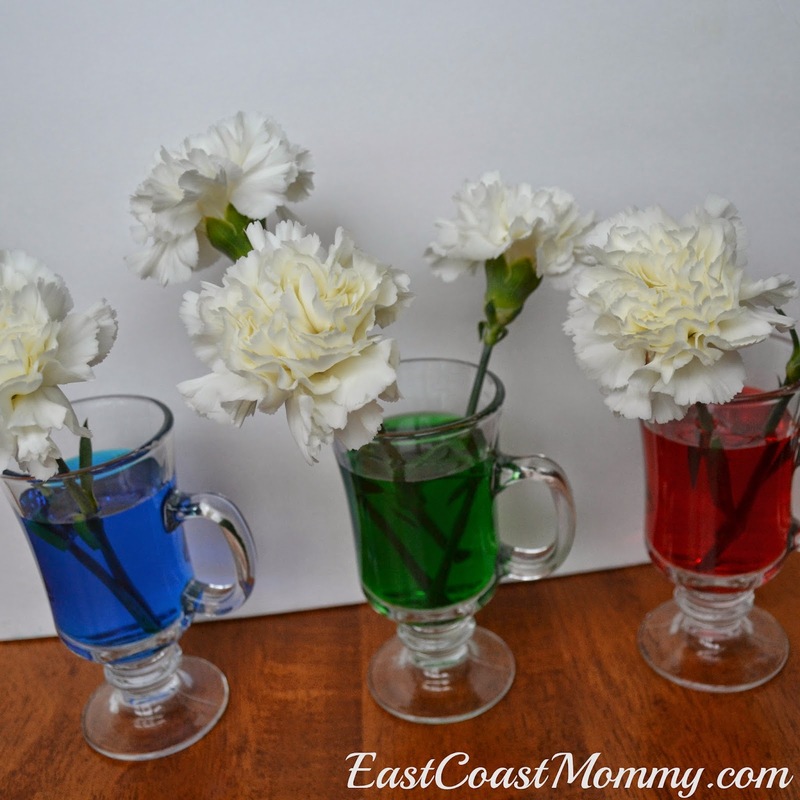 Find the free printable tags here. 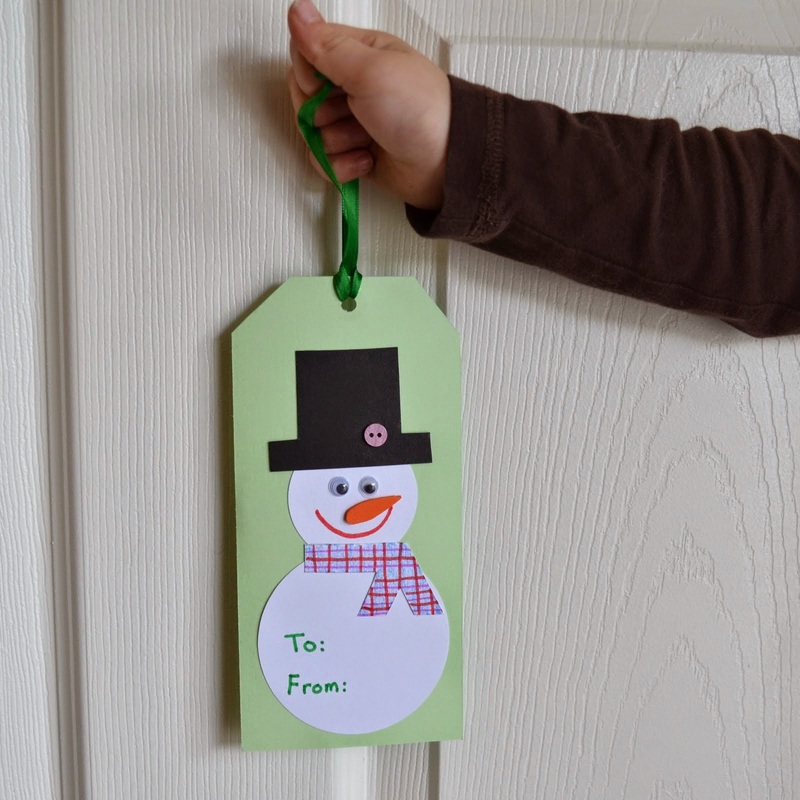 5) Snowman Gift Tag - Make a present extra special by having kids make their own homemade gift tags. 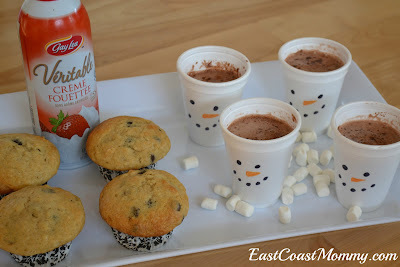 Find the tutorial for this super-cute snowman tag here. 6) Snowman Kisses - Print this adorable box, place a chocolate kiss inside, and share it with someone special. You can download the template for this sweet "kiss" box here. 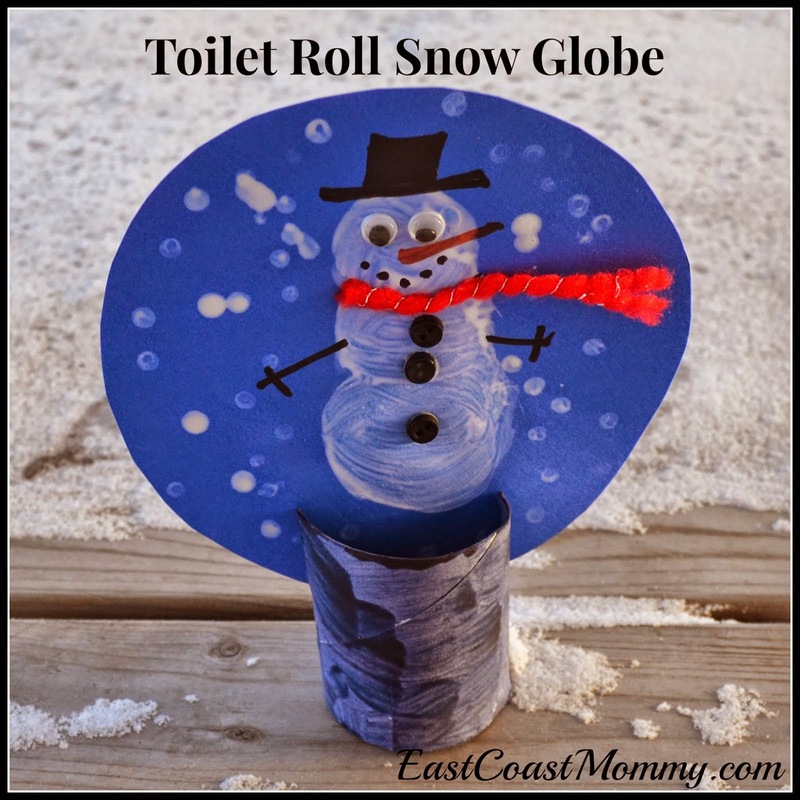 7) Toilet Roll Snowman - Grab some toilet rolls from the recycling bin and a few craft supplies, and the kids will love crafting these adorable little snowmen. You can find the full step-by-step tutorial here. 8) Snow Globe - This paper snow globe is a lovely craft for a snowy day. With a few simple supplies, you can make an adorable snowman that is guaranteed not to melt indoors. You can find the full tutorial here. 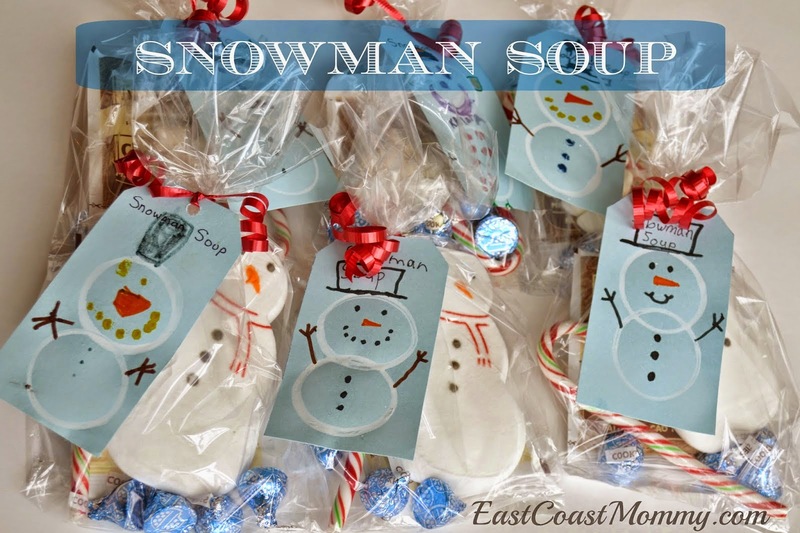 9) Snowman Soup - Snowman soup is fun to make and a delicious treat on a snowy day. Find all the details here. 10 ) Upside-down Snowman - Put a spin on a traditional winter activity by building an upside-down snowman. You can read about this fun snow day activity (and more) here. 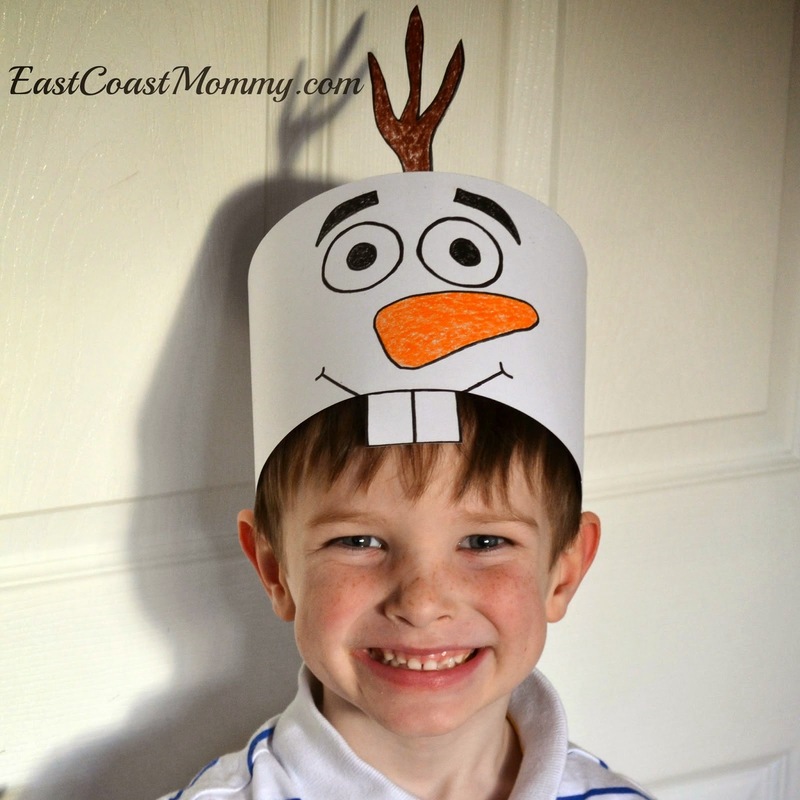 11) Olaf Hat - I love this simple Olaf hat craft. Just click the link, print the template, and start crafting! 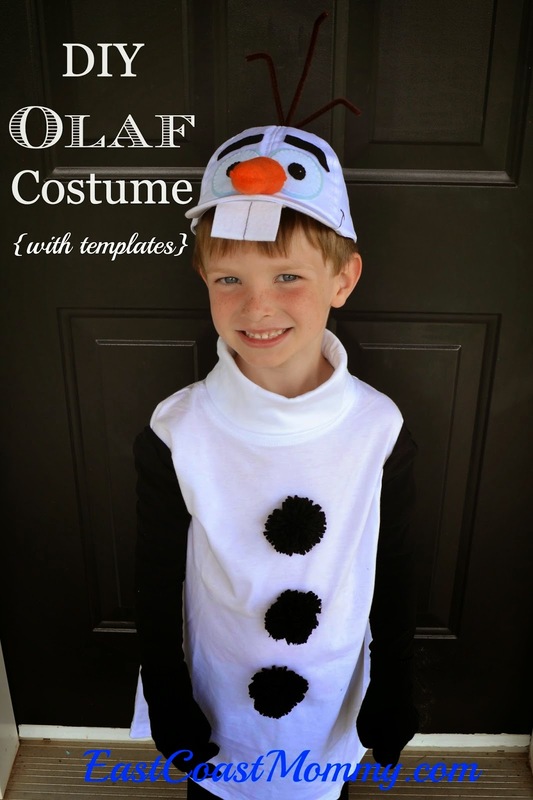 12) DIY Olaf Costume - Who wouldn't love to dress up as this adorable snowman. Click the link for the full step-by-step tutorial for this NO-SEW costume. 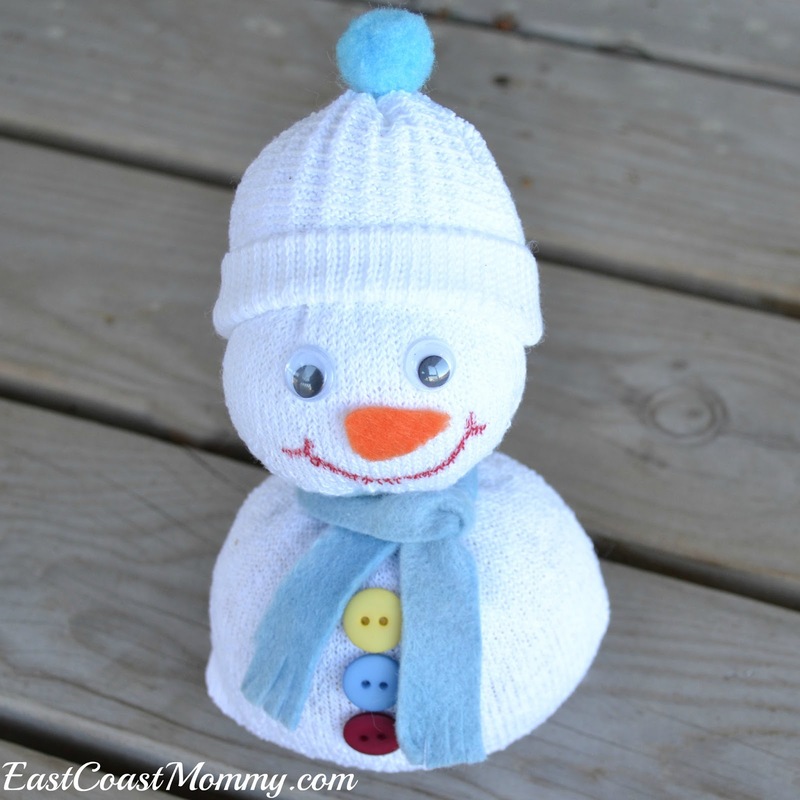 13) Spare Sock Snowman - Seriously... have you ever seen a cuter spare sock? Click the link for the simple step-by-step tutorial. 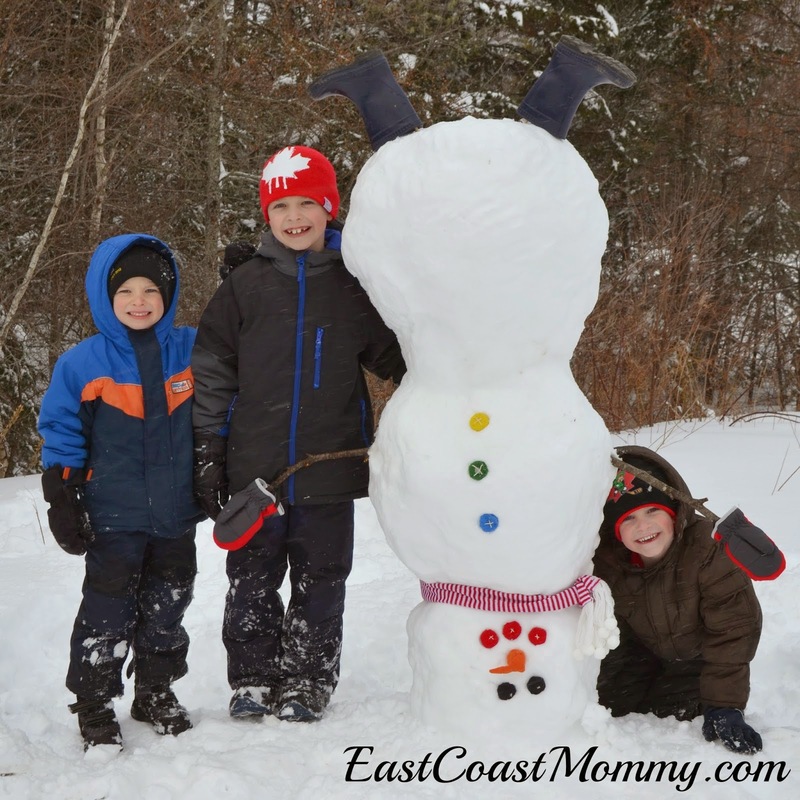 I hope you enjoy these fun and easy snowman crafts and activities us much as my boys and I did. Enjoy the snow while you can. Spring will be here before we know it! Holidays are the perfect time to share treats with friends and classmates, but many schools discourage kids from bringing sugary snacks. So, this year, my 5 year old will be sharing this non-candy Easter Bunny "treat" with his class. Cute, right? 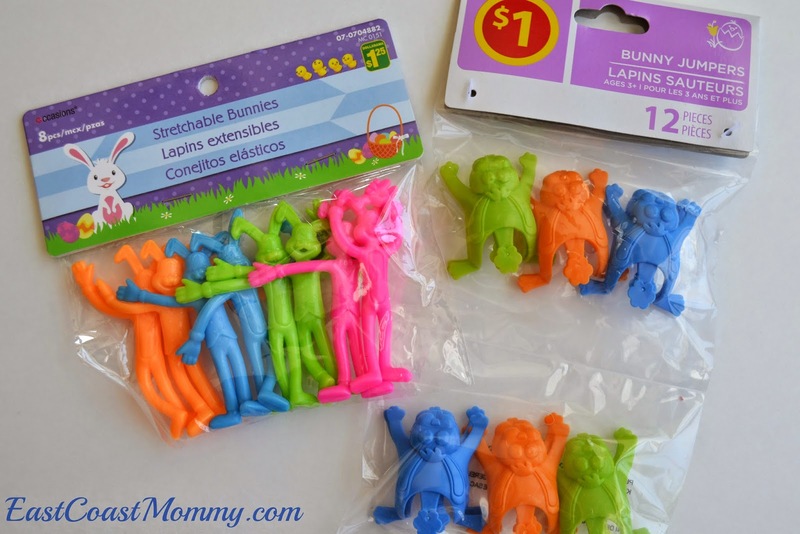 I found some inexpensive stretchable bunnies and bunny jumpers at the Dollar Store and Walmart, and I knew my youngest son would love them. 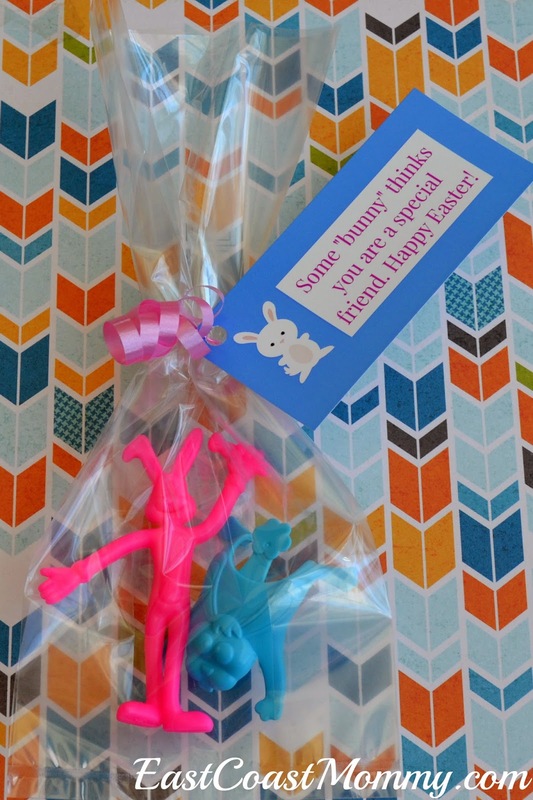 I packaged the bunnies in clear bags, and I designed a simple tag that said, "Some 'bunny' thinks you are a special friend." To download the tags for free, right-click on the picture below, save it to your computer, and print it like a regular 4X6 photo. 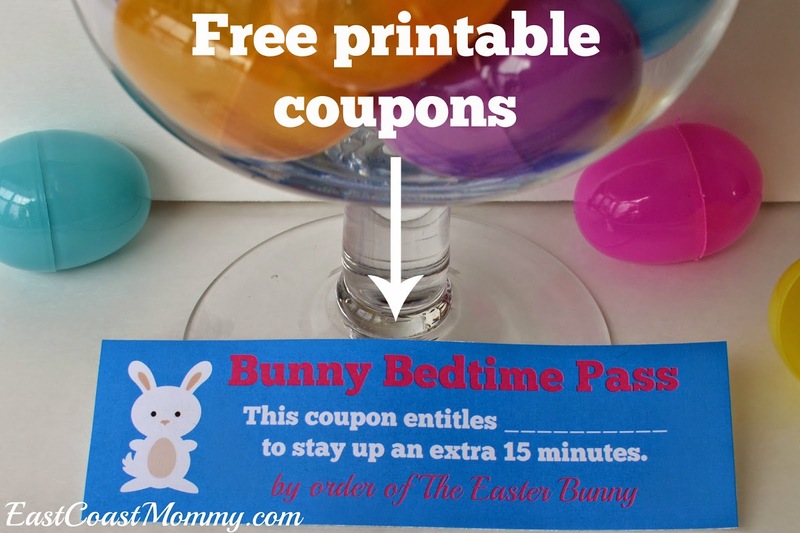 I love this little Easter Bunny party favor, don't you? 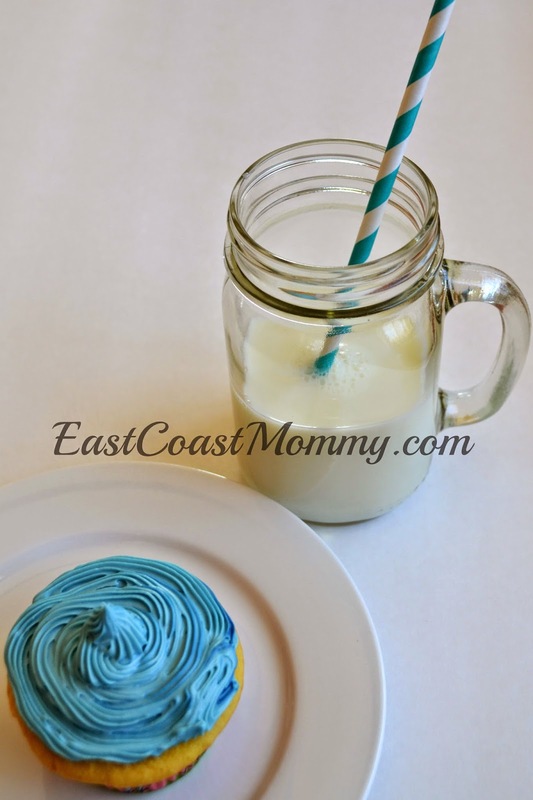 It's inexpensive, sugar free, peanut free, and totally adorable! Impressive and delicious treats don't have to be labour intensive. I just made 36 cupcakes for my 5 year old to take to school, and they were easy to make and everyone loved them. Want to know my secret? I started with store bought cake mixes and icing! 2) Melt 1/2 cup real butter in the microwave, and let it cool slightly. 3) Fill two muffin tins with paper liners. 6) Cook for 20 minutes or until a toothpick inserted into the middle of a cupcake comes out clean. 7) Let cool completely before decorating. I like to frost my cupcakes with Duncan Hines Buttercream icing (which is the only type of icing my 9 year old will eat). It is delicious, and has a great texture for decorating cupcakes. 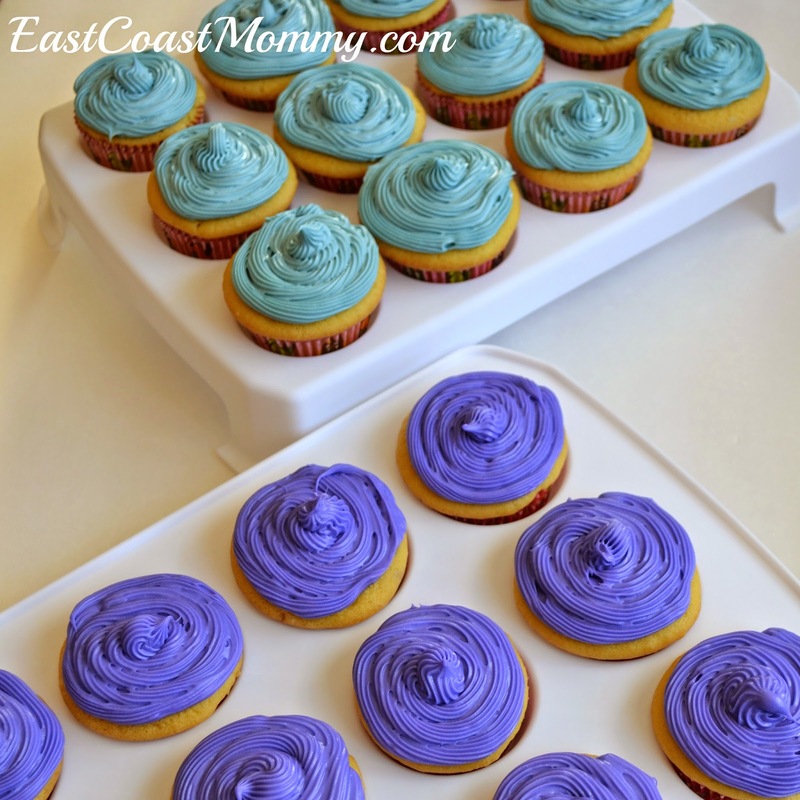 I use a piping bag and a large star tip to quickly decorate a huge batch of cupcakes. Give it a try and let me know what you think. 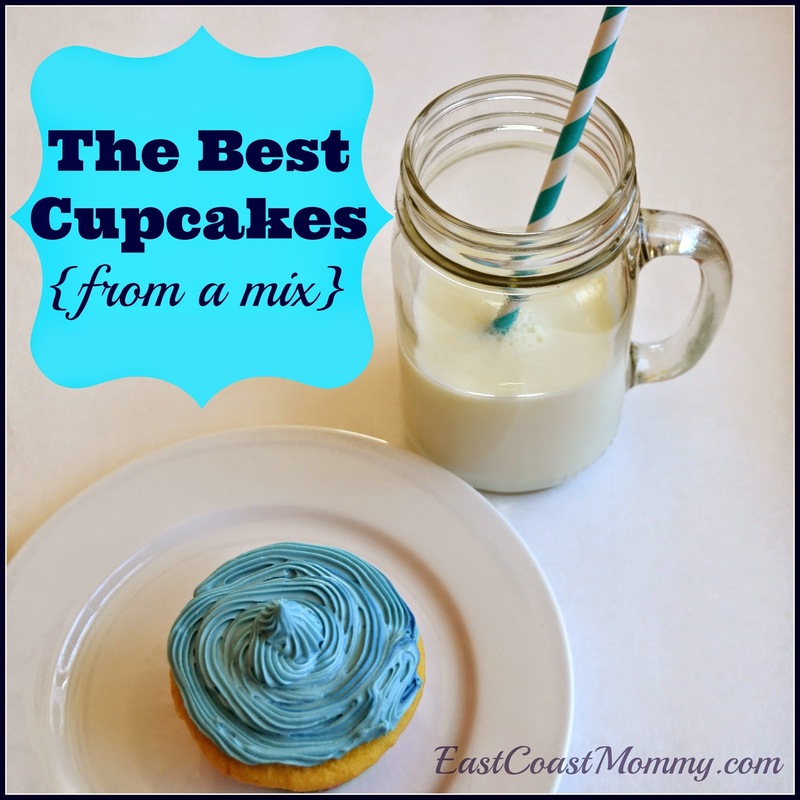 I am pretty sure you will agree that these are the yummiest and easiest cupcakes you have ever made. Holidays are fun, and perfect for crafting! 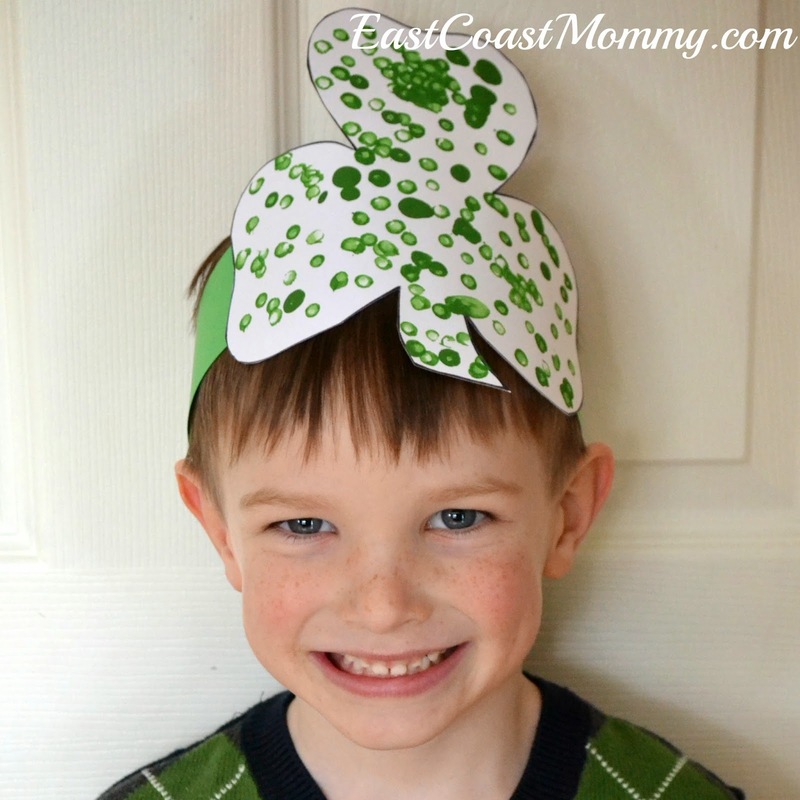 How cute is this Shamrock headband that my 5 year old made for St. Patrick's Day? 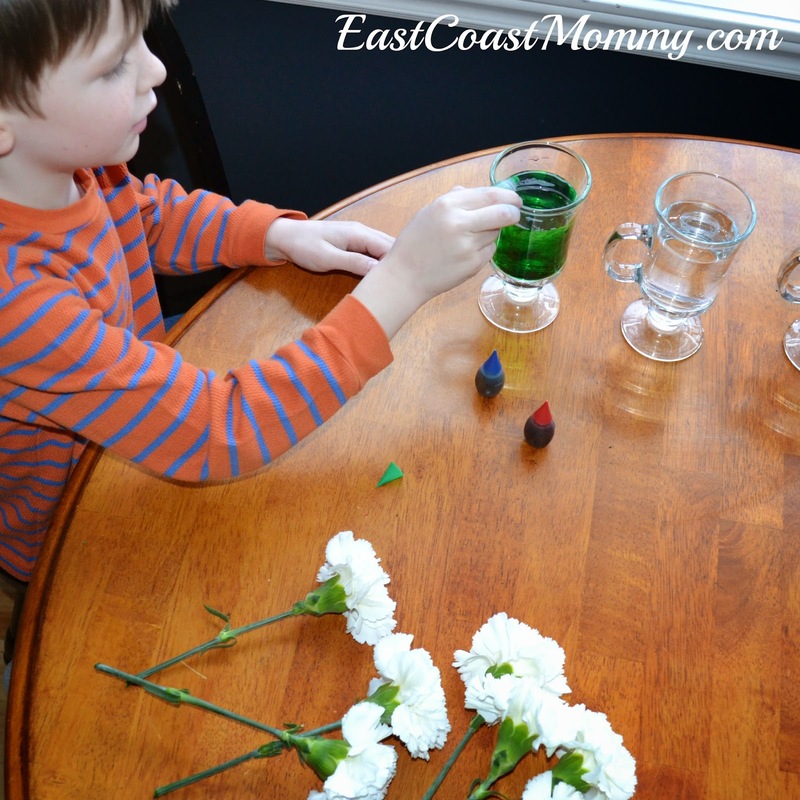 My boys and I recently crafted three different types of Shamrocks. You can find all the fun details over at CBC Parents here. Check them out and let me know which one is your favorite. Every year, my boys build a leprechaun trap in the hopes of catching a leprechaun (and his treasure) on St. Patrick's Day. 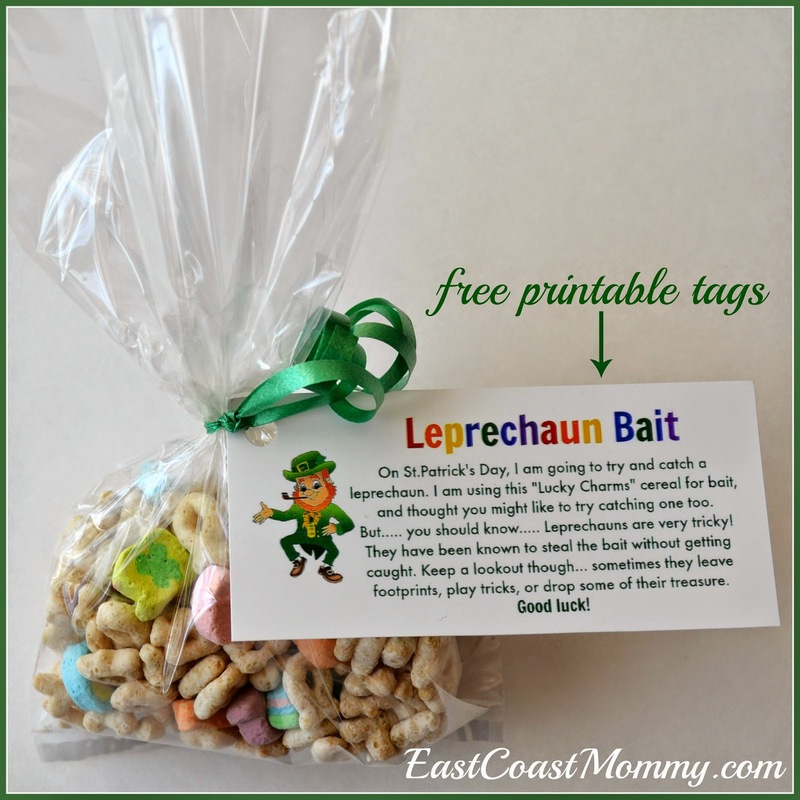 It is a fun tradition that my boys like to share with their friends, so each year, we make little packages of leprechaun bait for them to take to school to give to their classmates. This year, I designed this adorable little tag that you can download for free. To download the tag: right-click on the picture below, save it to your computer, and print it like a regular 4X6 photo. 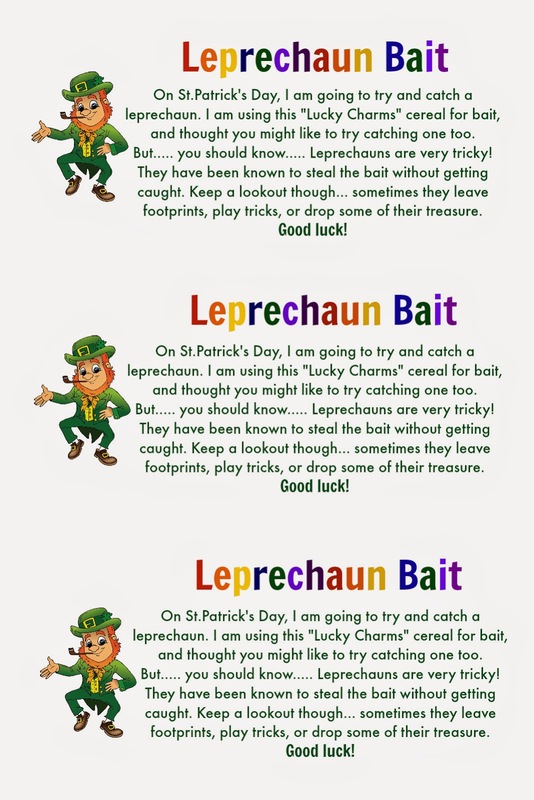 Add these tags to little bags of "Lucky Charms" cereal, and you have adorable packages of leprechaun bait. 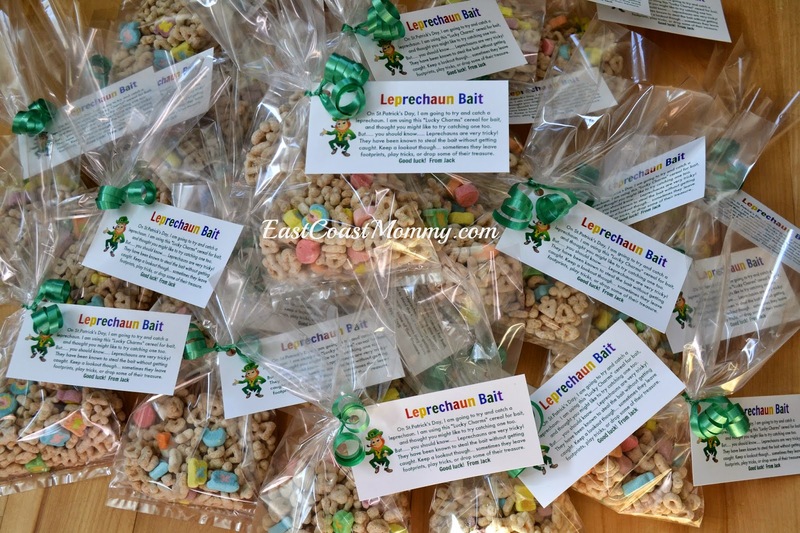 Aren't these bags of leprechaun bait sweet? 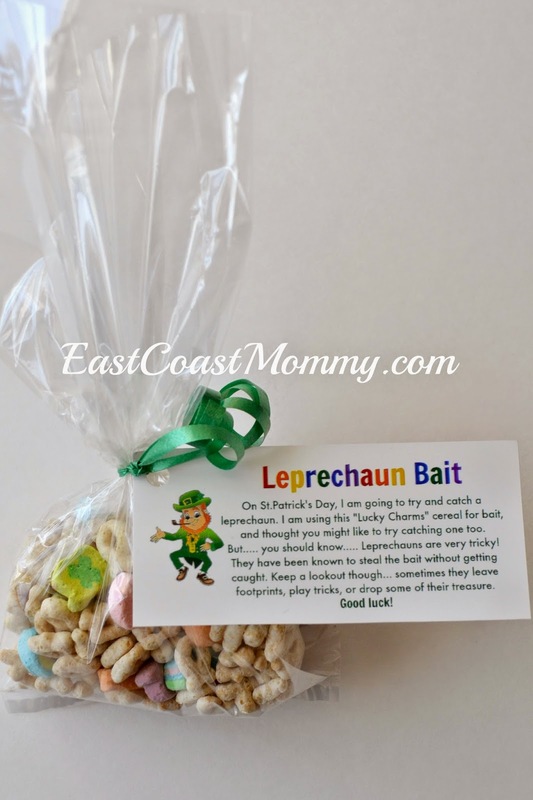 They are fantastic class treats, and they make fun St. Patrick's Day party favors too!